Use due dates to honour your commitments. Just make sure that you're only using due dates for things that are actually due. If you'd like to get something done by Friday, it might be tempting to assign that something a due date of Friday, even though it isn't technically due. The problem with assigning due dates arbitrarily is that it becomes difficult to distinguish between what's actually due and what you'd like to have completed by a given date. The end result is typically a growing number of "overdue" tasks and projects resulting in heightened stress levels. When used appropriately, due dates in OmniFocus are a great way of keeping track of your commitments. If you tell someone you're going to call them by the end of the week, create an action such as "Call Harry about upcoming trip to Zanzibar" and give it a due date of Friday. This is something you've given your word to, and not calling by Friday as promised could have consequences, large or small. As you become known as someone who honour commitments, you'll likely find that all kinds of new opportunities open up. If, however, there’s no commitment around having something complete by a specific date, leave the due date blank. If a particular task is important and is something you’d like to get done today, flag the task to make it stand out from your other available tasks. If it's something that you'd really like to get to on Friday, flag it and then defer it to Friday. Once Friday comes along it will become available and the flag will remind you that it's especially important. Tags can also be helpful for defining time frames and making sure that projects and actions aren't forgotten. 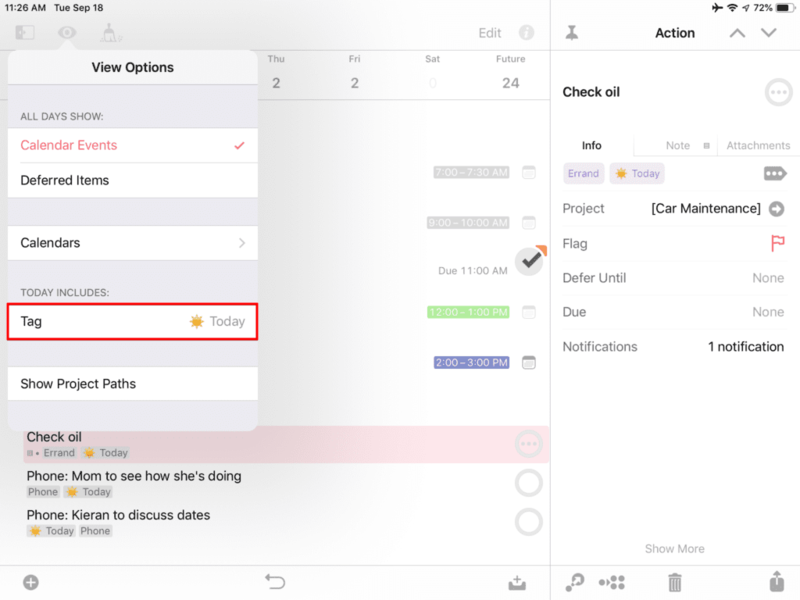 In OmniFocus 3, you can designate a "today" tag in the Forecast perspective. As the name implies, all available actions that contain this tag will show up under "Today" in the Forecast perspective. This provides a convenient way to see tasks that you've earmarked for today alongside those that are deferred and due. It can also work well to use tags to represent different times of day (e.g. morning, afternoon, and evening), days of the week, months and years. Our Tags for OmniFocus 3 examples contain a section showcasing examples of date and time tags.